Omnichannel experience for their clients in the financial service industry. Share One is a technology solutions provider for financial service industry clients. With the world moving towards mobility solutions, they noticed a gap between their clients and third-party app providers. Share One delivers a robust core processing system, along with other web-based products specifically designed for the financial industry. 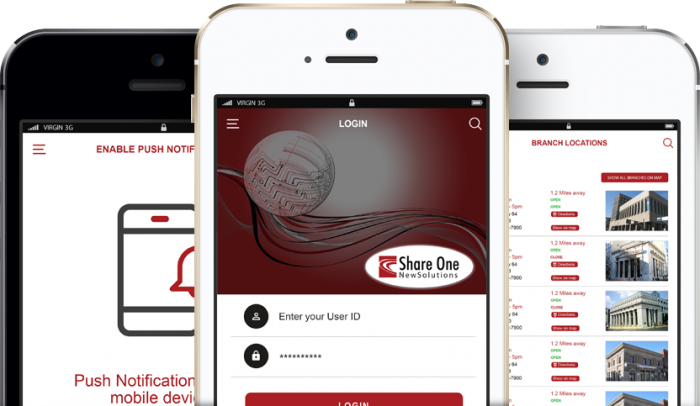 Share One decided to revolutionize their product offering with a mobile application which is tightly integrated with their core processing system. 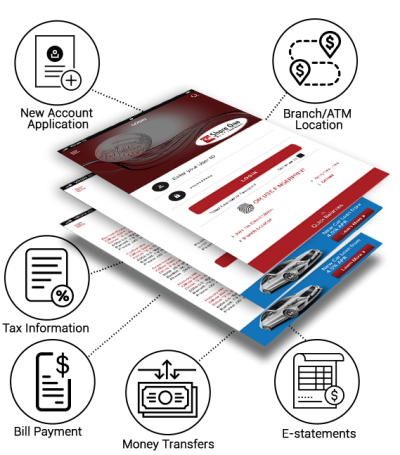 With Share One’s financial software expertise and App Maisters’ technical and development support, the developed mobile application provides a cohesive, omnichannel solution for their clients. Share One’s goal was to deliver a high quality, tightly integrated mobile application customizable to each client’s requirements. The customization includes the clients own branding colors and landing pages, and the ability to deploy features they choose such as: bill payment, money transfers, e-statements, tax information, loan and new account application, overdraft payment, remote deposit capture, and branch/ATM location services. The mobile application provides Share One’s clients the opportunity to stay competitive in the financial marketplace and for their end-users to manage their finances on the go. Along with the several other features; App Maisters ensured, with extensive feedback and log mechanism, that checks were deposited, logged, and history was recorded while providing end-users with instant feedback. App Maisters also integrated two separate services to fetch detailed data on specific financial institutions’ branch and ATM locations for the mobile application. With the application, a web service is implemented that provides information about colors, theme and links (active & orders) which automatically re-skins and customizes the application after receiving an update trigger. The mobile application has an omni-channel look and feel replicating Share One’s Home Banking software. The mobile application has a omni-channel look and feel which replicates Share One’s digital web-based product offerings, working in a similar manner, eliminating the learning curve and providing a better end-user experience. Share One’s mobile application offers superior integration, and a more convenient solution for their clients who want to eliminate multiple technology vendors. To build a mobile app within the time required, we knew that outsourcing the development made sense for us. We wanted to tap a company that had a good reputation and which we felt could deliver a quality project in a timely fashion. We discovered App Maisters and felt confident of their capabilities after an extensive due diligence process.